RodPrjónar: Steeking and pictures from the trip!! Steeking and pictures from the trip!! Well, well. 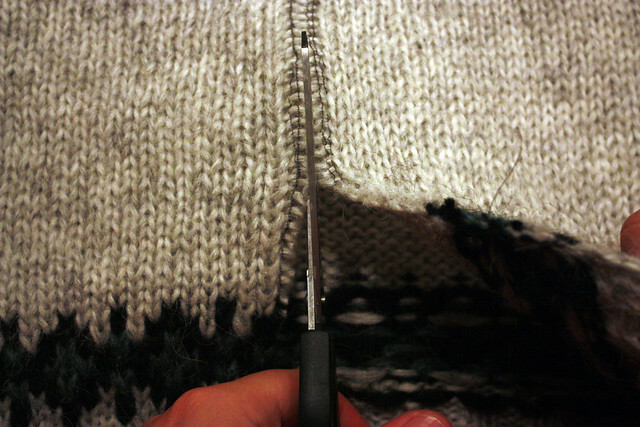 This week was devoted to steeking. This was the first time a did it myself (with lots of help from Gummi, whose first time was also this!). 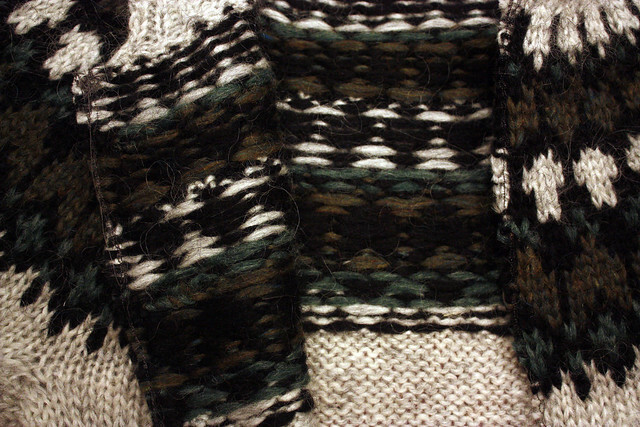 Before steeking the lopapeysa, I made a little exercise. 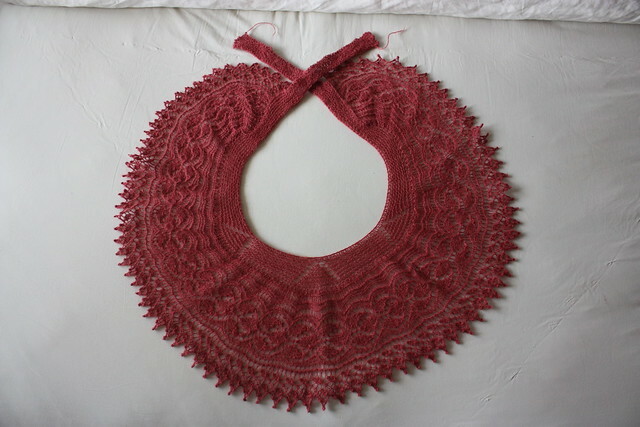 Remember the Harebell fichu that I knitted a few weeks ago? As soon as I finished it and bloked it I had the impression that it had turned put to be TOO big to be held around any woman's shoulders. I actually tried it on several friends and yes... it is too big to tie it in front. So, I decided to cut the bands so it can be used wrapped around the neck and shoulders and maybe held with a brooch if desired. 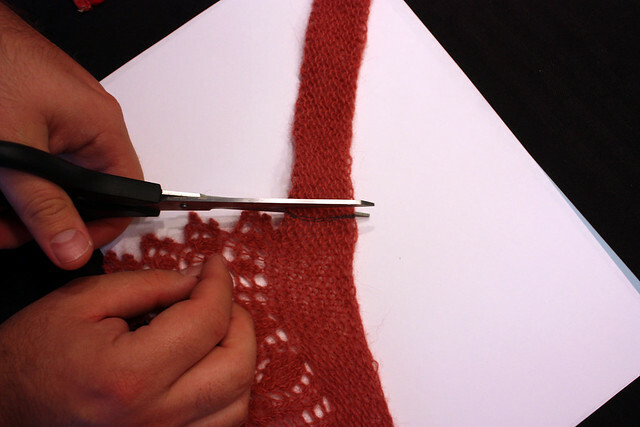 This was the perfect moment to try to cut a knitted piece as a practice before cutting the big project: Eva's hoodie lopapeysa. And now it is REALLY ready to be used!! So, after the little training we were ready to take the big task: Cutting the lopapeysa. 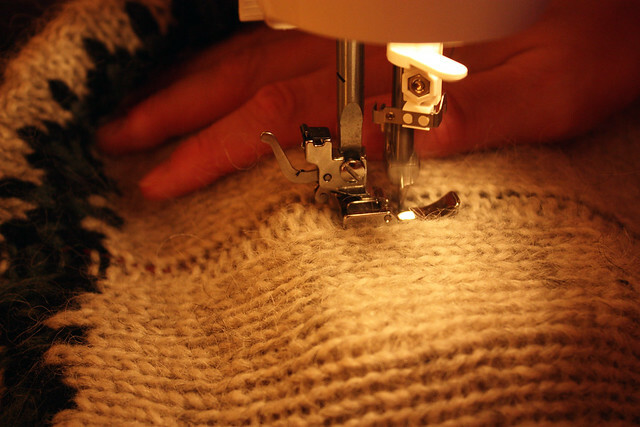 Sewing to secure the edges. Back and forth on each purling. Be careful with the blade of the scissor that you don't see... 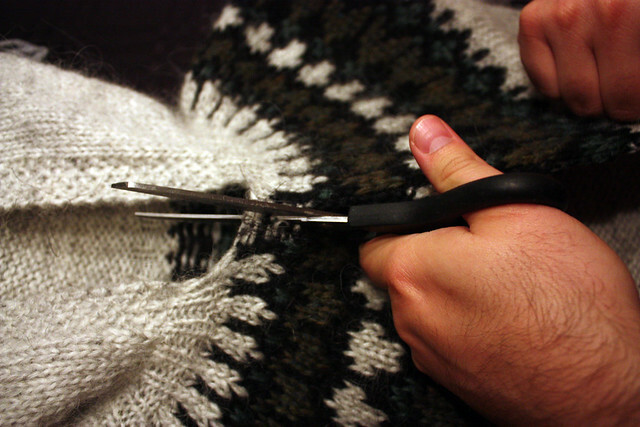 I almost cut the back of the cardigan! Now it is ready to get the zipper! 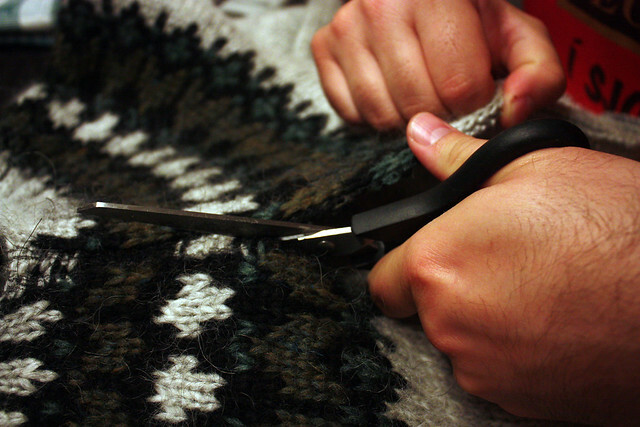 I must admit that the idea of cutting the knitting sounds TERRIBLE and SCARY but it is not! 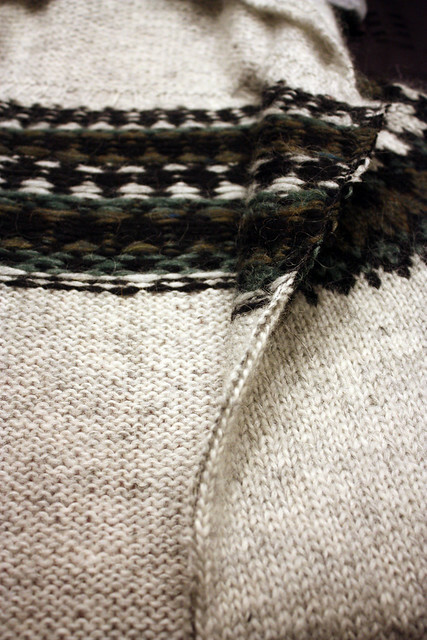 The important thing, in the case of a cardigan, is to make the "path" where the sewing will go. 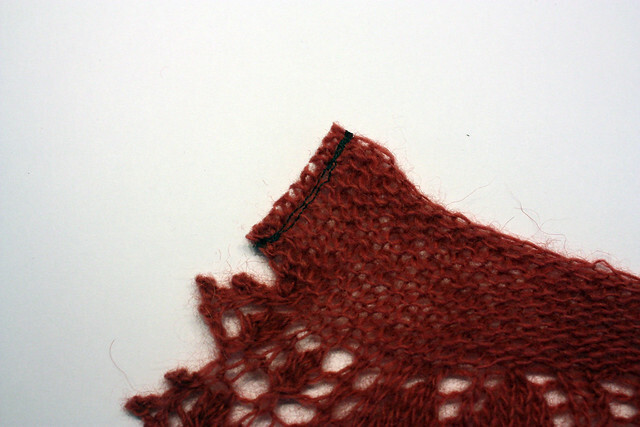 In this case I made a colums made up of two purled stitches. Then the sewing machine dies it all! In this case I also made a double sewing on both edges so I could cut between them. So, don't be scared of doing this! I think it is very difficult to mess it all. Finally, as I promised here are some pictures of my last trip to the East Fjords! Rodri me puse a llorar de emocion, me encanta , que hermoso debe ser alli , de verdad, medio salvaje, medio virgen, entre cielo, mar , fiordos, y esas montagnas que hermoso , es precioso, es el lugar priviligeado para los artistas, ohh que hermoso !!!! Con lo que a mi me gustan las chaquetas!!!! Y muchas gracias por el paisaje y la musica. Hola, hola, por aqui de visita y la verdad que precioso chal, aun con la sensura de las bandas, y esas fotos, fabulosas, la musica fantastica, es un regalo mpara la vista, muchos saludos y un abrazo de oso cariñoso, bye. Me ha dado un vuelco al corazon cuando te he visto con las tijeras, ahhh!!! Luego he visto que ha quedado genial, pero vamos, yo no me atreveria a hacerlo... Pedazo de video!! Tu isla es preciosa, que espectáculo de fotos!!! 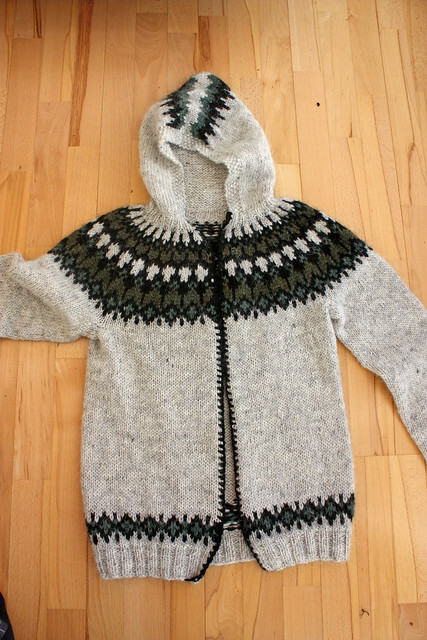 When you started in on the lopapeysa, I'm sure I held my breath the entire time you were cutting! I don't care how well it turned out, I still don't think it's anything I'll ever do!! 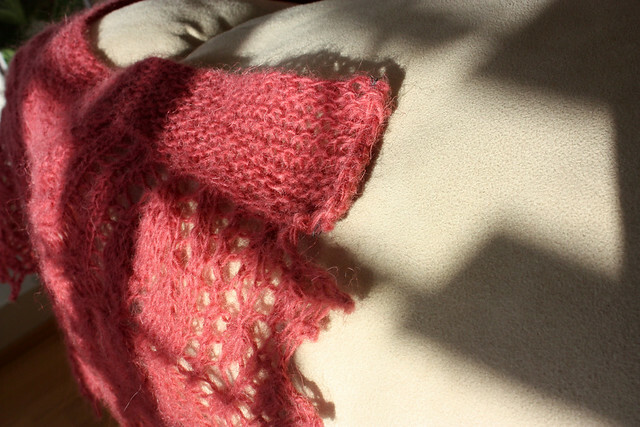 I do like the dark crochet along the edge. Have you thought about doing the same around the edge of the hood, too? Wonder if it would help keep it from stretching out. I don't know - just a thought. I really enjoyed the "Clip" and didn't notice any problem with any of the pictures. In fact, it just blew me away that there is that much natural beauty in Iceland!! What a gorgeous area! Helps to have someone taking the pictures that has such a good eye for it. :-) Loved the progression of the seal and seeing him face to face. I did have to chuckle at the sheep running down the road in front of you. 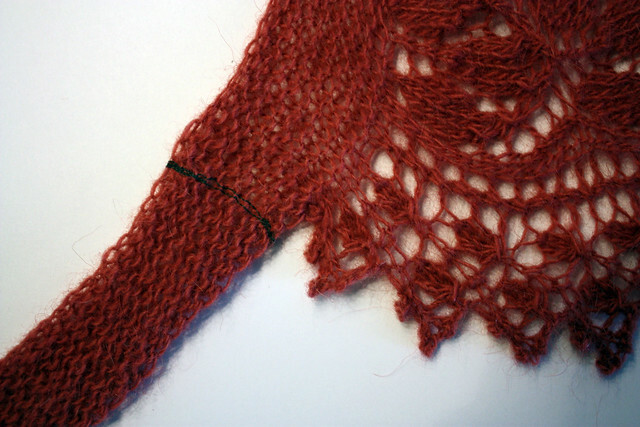 Maybe you could have caught one and sheared it so you could have made yourself some yarn. :-) (Honestly, spinning and all that goes with it does not interest me at all! Glad others like to do it so I can just enjoy the fruits of their labors.) Was wondering if that area gets totally covered in snow in the winter and do those bodies of water totally freeze over? Saw the chunks of ice, so figured it wasn't any too warm there! Also noticed a wet porch and road, so rain must have fallen while you were there. Makes for a great excuse to stay in and knit. :-) I've already watched the clip twice and feel certain there will be more visits to it. Hard to soak it in in one viewing. Only thing I think I missed with doing it that way are your personal comments about each photo. Oh well, can't have everything, can we? or can we?! aagghhh! Ver esos hermosos trabajos tejidos y tijeras es como una película de horror!!!! Es resultado es precioso, pero aún no tengo el coraje de probar esas técnicas. Me gusta mucho el chal ,pero lo veo dificil de hacer, la idea de la chaqueta me encantó, nunca se me había ocurrido hacerla así,más fácil que tejer los dos delanteros por separado,genial. Alex: Atrévete a cortar no más! 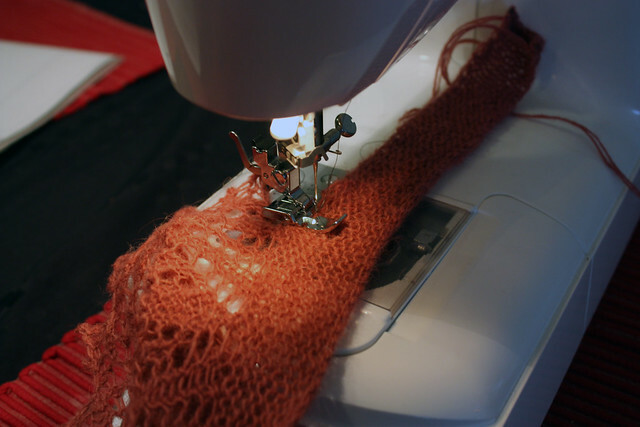 Sólo necesitas una máquina de coser y ya. 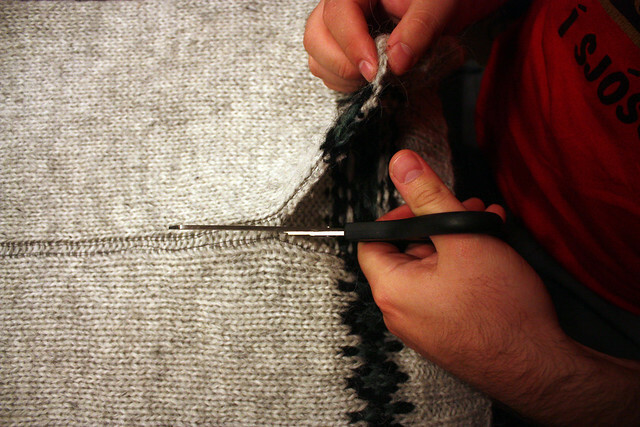 Incluso hay una técnica para hacerlo sin máquina de coser... usando sólo un crochet para asegurar los bordes. A mí me parece mucho más seguro con la máquina de coser. Björk es una genio en todo lo que hace! Besines! Asun: A ver si te animas y te haces una chaqueta! Tejerla en circular es rapidísimo y luego sólo cortar y poner el cierre o botones :) Qué bueno que te hayan gustado los paisajes y la música. Un abrazo. Judi: Well, as I always suspected the "hairball" resulted to be way to big... so cutting was the only solution the came to my mind to make it 100% wearable. I am happy that my idea worked! I even think it looks better without those bands :) I agree with you about the color... I am definetely going to use it again! I thought about crocheting around the border of the hood also but I didn't. 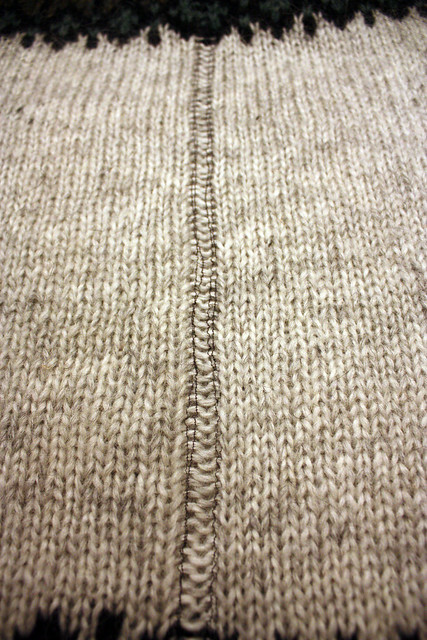 I thought it wouldnt look good because I knitted the border of the hood using seed stitch. The east of the island is wonderful. Lots of mountains, waterfalls and fjords. You're right. This isn't a very warm area. The last snow there was during the second week of June this year... that is why there was still some snow on the mountains. During winter it snows A LOT there so much that many of the roads become impassable. Of all the places I saw the one that keeps me still freaking out is Mjóifjörður (where the seal and the rusty ship are). It was SO beautiful! And imagine this... only 30 people live there! Luciana: jejeje. Parece que casi mato a varias con estas tijera, jeje. Gracias por tu visita! Mayte.M: El chal fue una odisea... especialmente el principio. Me costó un poco entender el patrón y construcción del chal... pero una vez entendido se hizo todo mucho más fácil. Hacer una chaqueta de este modo es MUCHO más fácil y rápido. A ver si te animas! Saludos! Hola llegue a tu blog por la invitación que hacía mademoisellealex, que bueno que vine porque tienes trabajos maravillosos. Tejes espectacularmente, quedé literalmente boca abierta. Desde hoy te sigo. ¡Cuánta valentía con la tijera tienes! He buscado un correo pero no lo he encontrado. ¿Podrías enviármelo aquí: lamaisonbisoux@gmail.com? Oh my goodness! 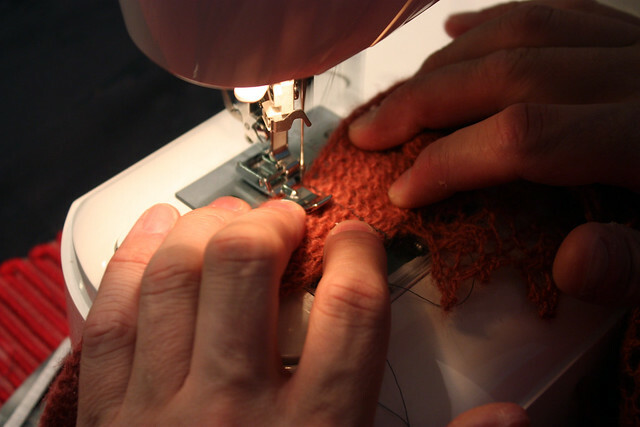 You are very brave with your cutting and sewing knitting! It looks fabulous! Well done! Ale: Ooy! Lo mismo le pasó a mi hermana! Hace un tiempo un sweater para mi sobrino y lo metieron en la lavadora! El pobre lloró tanto cuando lo vio! Le gustaba tanto que hasta dormía con él! Faerfay: Thank you so much! I am sure that Australia is as beutiful as this island! Thank you for posting the clip. Beautiful pictures. Truly amazing!